“…and there you have it, another body on the floor surrounded by things that don’t mean much to anyone except to the one who can’t take any of them along. ” There is nothing as unsettling as not knowing what the hell is going on. House of Leaves takes some fairly standard horror tropes – a wealthy family moving into a new home, moving hallways, encroaching insanity – and slides them into a book about a book about a book about an academic analysis of a film (called The Navidson Record), and because it’s all smart, tense, and inventive, this novel is far more engaging than it sounds. There’s something wrong with the house the film takes place in. Something very, very wrong. Danielewski is determined to make you afraid of the dark. Adult fears are made explicitly metaphorical as the house plays on characters’ insecurities and baggage, which gives a focus to the narrative as things get stranger and stranger. I very rarely get scared when reading books (horror games are another matter). That’s why it was so surprising that while reading this thing, during a couple of moments, I felt true fear gnaw at me rather than the nervous excitement which horror stories normally draw out. It’s also very well paced, as I tore through this thing in around a week. I just had to know what happened. This is a very, very flawed book though. The sections with Johnny Truant are almost the complete opposites of those about The Navidson Record, for what I’m guessing are tenuous thematic purposes: instead of academic, the tone is casual; instead of claustrophobic or daunting, things are grounded; instead of carefully written, things are sappy and dull. Truant’s prose is painfully cliché times, particularly when it comes to descriptions of women (“blue eyes, like sea-ice”, “eyes would sparkle like the Northern sky”, “everything about her shimmered”), and Danielewski tries to use a stream-of-consciousness style that falls flat. The contrast of the cool academic analysis of The Navidson Record only makes this worse by comparison. I literally groaned out loud more than once when I realised another lengthy Truant section was starting. The formatting changes later in The Navidson Record in the book might also come across as gimmicky if you’re not in a generous mood. 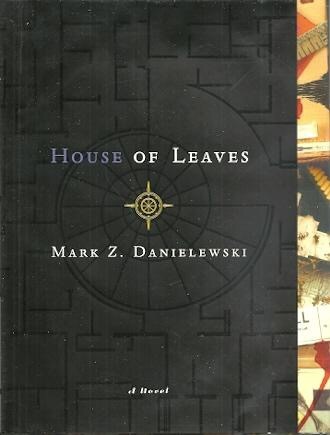 When House of Leaves works, it’s because Danielewski understands how to cleverly subvert readers’ expectations. He plays on our assumptions about genre and the world around us and shreds them, placing them back together with masking tape, out of order, and with confusing annotations. This book just shoots too high sometimes, and becomes pretty silly for stretches as a result. It’s still worth a read, particularly if you’re in the mood for something experimental, just bear in mind you’ll need patience.